Can't take the artist home, clone the performance! ArtistCloner, cloning audio experiences! The new (2018) CARBON interconnect is an amazing performer. Created with *6N-OCC solid core copper (99.9999%), a proprietary flexible carbon impregnated tubing (pure silk dielectric for the STAGE ONE cable and Teflon for the STAGE TWO cable) these interconnects are like no other. A direct and emotional sound signature brings to life audio performances with little interference from cable transmission anomalies. Reverb, rhythm and room cues are rendered with a stunning realism. The CARBON INTERCONNECTS have no design configuration cousins in the industry and are top tier performers in rendering suspension of belief performances. These interconnects let the music flow more easily from one component to the other which results in many cases sounding louder than most other cables by comparison. ''I have been listening to high end audio gear for nearly fifty years as a producer of live acoustic concerts, an electrical engineer and a physicist. You can only imagine the innumerable audio products that have been part of my system during this time. 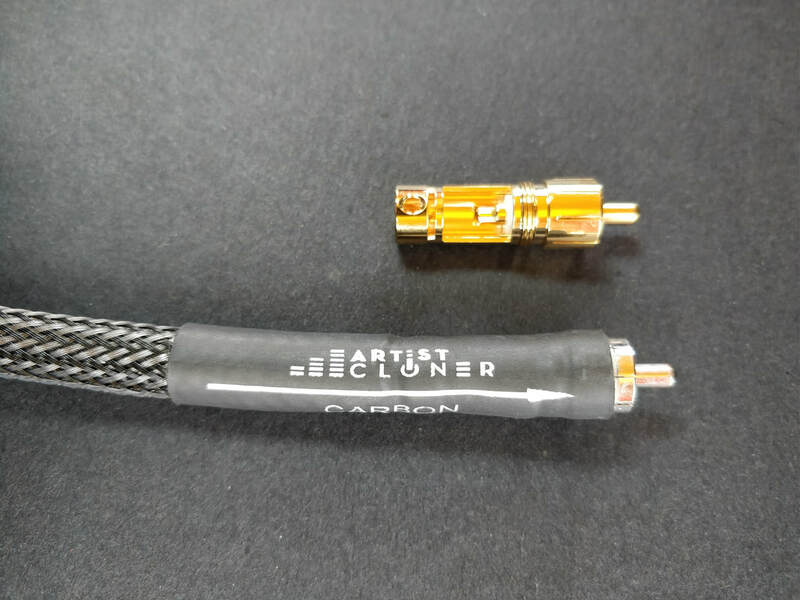 Your ArtistCloner Carbon interconnects are beyond any competition. The STAGE TWO interconnect has the same CARBON tubing but also features dual Teflon tubing and a slightly different design. 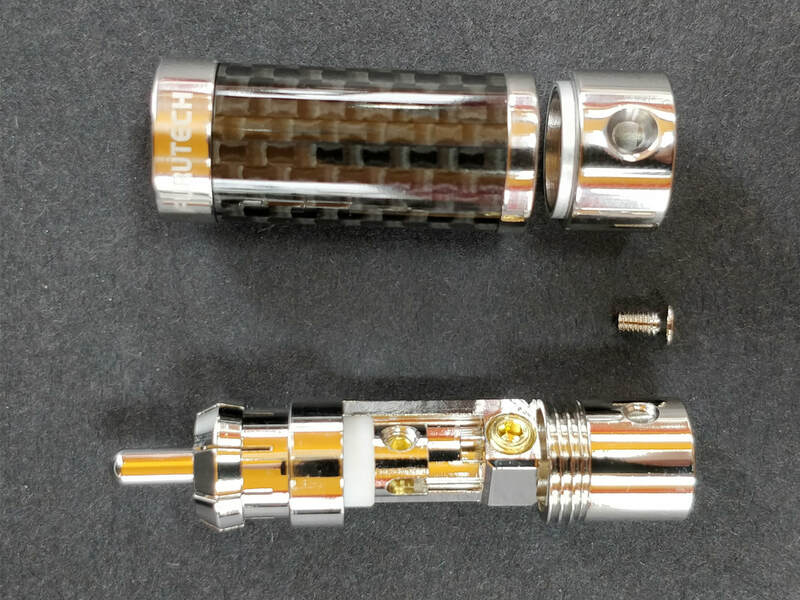 It incorporates the FURUTECH CF-102(R) CARBON FIBER connectors which have adjustable pressure ground contacts which guaranties a perfect connection. The CF-102(R) are also solderless and relies on screws to connect the wire which eliminates audio anomalies related to soldering. The increase in performance over the STAGE ONE cable has the following qualities: increase in resolution, sound stage, 3D (depth) and a livelier more intimate presentation over all. The proprietary flexible carbon impregnated tubing found in both designs is effective at rejecting external noise (EMI / RFI) and provides a quiet environment for the signal to flow through. The result brings about an elevated contrast to the audio performance. The stage two has even greater noise rejection and a lower noise floor in regards to the stage one interconnect. Building on the excellent ArtistCloner reputation let us introduce the Carbon Balanced cable. Featuring Teflon insulation and Carbon grounding technique for ultra low noise­. It incorporates the Neutrik crystalCON connectors with Swarovski crystals and gold plated connectors in a metal housing. This cable has the following qualities: a life like emotional presentation of the recorded event with great resolution, 3D soundstage and precis imaging. *6N-OCC COPPER (99.9999%)-used in most top of the line cable products, 6N-OCC provides the superior quality copper. OCC (Ohno Continuous Cast) is the name given to the casting process developed to help defeat annealing issues and virtually eliminate all grain boundaries in copper or silver with a unique patented process. The OCC casting method stretches single copper crystal to a whopping 125 meters in length. Stretching the crystal makes for a much smoother path for the electrons to travel. The difference between the non OCC copper and the OCC 99.9999% copper is like driving a car on a repaired asphalt road with cracks (non-OCC copper) and a brand new road (OCC 99.9999% copper).